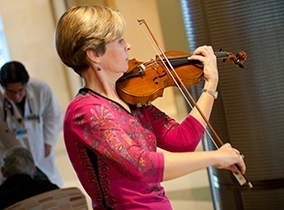 Mayo Clinic patients, visitors, and staff have numerous opportunities every week to enjoy varied musical selections performed by both local and visiting musicians. Concerts are performed on most Mondays from 12:10 to 1 p.m. in Lips Atrium in the Charlton building. Be sure to check the schedule published above, or the Events Calendar for performances dates and times. Concerts are typically performed on the first Thursday of each month in the Gonda Building-Geffen Auditorium, featuring Mayo Clinic staff sharing their talents as a "give back" to patients and employees. Be sure to check the Events Calendar for performance dates and times. Concerts are performed every weekday on the historic Rochester Carillon, the only carillon owned by a medical center in the world. Selections range from classical favorites to pop and jazz standards, and highlight the diversity of Mayo Clinic staff, patients, and visitors. Art from around the world — photography, pottery, paintings, drawings, sculptures — that encourages quality of life at all stages of living is featured throughout the Mayo Clinic campus, both in permanent installations and special exhibitions. Live theater or dance performances to inspire, teach or address universal human issues are held regularly and are open to all members of the Mayo Clinic community. Renowned speakers in medical ethics and the arts focusing on numerous topics are frequent visitors of Mayo Clinic. This series of programs engages professional artists directly with patients, exploring the transformative, healing power of the arts. Visual artists, writers, musicians, and music therapists are available to visit patients in their rooms for private instruction or performances. For information about scheduling and availability, contact the Mayo Clinic Dolores Jean Lavins Center for Humanities in Medicine at humanitiesrochester@mayo.edu. For information about scheduling and availability, contact the Mayo Clinic Dolores Jean Lavins Center for Humanities in Medicine at humanitiesrochester@mayo.edu. Additionally, the Mayo Clinic Dolores Jean Lavins Center for Humanities in Medicine is a member of the American Society for Bioethics and Humanities. The Mayo Clinic Dolores Jean Lavins Center for Humanities in Medicine, through the generosity of its benefactors, has brought many distinguished lecturers, events, healing music and thoughtful conversations to Mayo Clinic. From the rousing drums and dancing from Ragamala and the Taiko drums; to a conversation with Samuel Holiday, a WWII Navajo Code Talker; healing art from Christopher Ayers during his cancer journey; each year is filled with numerous and varied events that speak to Mayo Clinic's commitment to patient care through the humanities.